Does your septic tank smell? Is your septic tank overflowing? 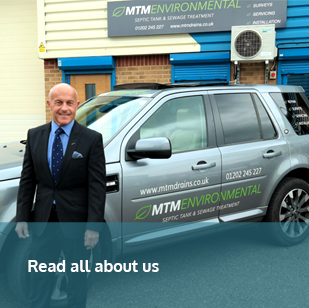 MTM Environmental and Civils Ltd provide professional services in the field of septic tank & soakaway repair, installation and maintenance. Whatever your needs in the field of drainage – septic tanks, cesspits, soakaway systems, sewage treatment plants, site surveys or drain repair – we are the first people to call. We are providers to domestic and commercial customers for all drain services throughout the south of the UK. On this website you will find a description of what we do and advice regarding any drainage or sewage problems you may encounter. We offer independent advice on most makes of sewage treatment plants. Specialist pages have been set aside to what options you have if your house is not on mains drainage, an explanation of the operation of a septic tank, an illustration of how soakaways work and what to do if you have drainage problems. As specialist engineers in the drainage field we use the latest technology for septic tank, cesspit and soakaway inspection & survey. Our key strength is the experience of many years repairing septic tank & soakaway systems. We respond to all calls, messages and e-mails, promptly!! Our aim is to deliver the best septic tank and drainage service in the south and south east of England. “We’re very pleased with the work done. I’m so pleased we went with your company. You all went the extra mile which we really appreciated. Especially in such horrendous weather conditions. We won’t hesitate to recommend you to friends and family.